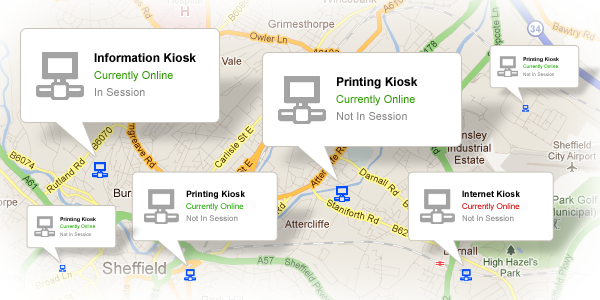 How many of your kiosks can you see right now? Do you ever wish you could be in two places at once? If you’re responsible for managing a national or even international network of kiosks this feeling should be quite familiar. One of the main challenges with spreading yourself far and wide is being unable to see what is happening at each location. No-one can be in two places at once and very few of us can afford a small army of engineers running around monitoring things for us. Genkiosk is the kiosk software solution that provides a high degree of visibility from a number of different angles, from viewing your whole estate, right down to examining individual machines. Significantly reducing both travel costs and man hours, you can see everything you need to in a faster, cheaper and more comprehensive way. Genkiosk uses powerful reporting functions that provide up-to-the-minute statistics whenever required. These reports offer a way of usefully capturing – and distilling – vast amounts information, making the whole thing much more user-friendly. You’re made aware of issues as they occur and given vital insights to help you diagnose any problems. With the tools available you’ll be able to make a much more in depth analysis of your users and your market. Using the audit trail you’ll be able to see who did what & when; what their interests are, and how much money they spent. You will have access to a wealth of knowledge about your estate, making you better able to target your services and make sense of what is happening on your kiosks. A well-managed kiosk estate, smooth-running kiosk software, increased revenue, and lower overhead costs. This may all sound too good to be true and some of your stakeholders may take an “I’ll believe it when I see it” approach. The beauty of it is that Genkiosk allows you to show them..